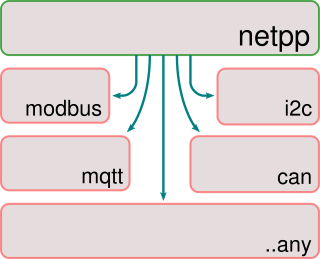 netpp (network property protocol) simplifies the development of remote control or measurement applications significantly. Originally, it was introduced as slim abstraction layer for register based protocols (which are still fully supported). 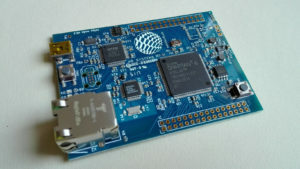 It has grown into a software library which allows rapid and robust development of device control applications. Devices are described using an XML dialect using a graphical editor. You, as the user start top-bottom: You define first what the device should do – the functional way. Then you connect it to the hardware. This description is then compiled into software, hardware and documentation. For example, parameters such as register bits or commands are specified as ‘Properties’ and are mapped to the corresponding hardware entity. 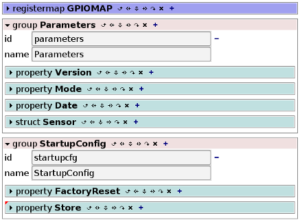 So you can for instance map an i2c register into an abstract property called ‘Temperature’. The XML editing can happen according to a graphical scheme, as shown above. We recommend to use the XML Mind XML Editor (XXE) with integrated XSD schema validation. Using simple intrinsic mechanisms for revision control, software, hardware and documentation are kept in sync. No more mistakes in developer team communication! The netpp slave library code is very compact. Besides startup code (crt0.o) and hardware drivers no excessive program logic is required for a bare metal remote control OS.